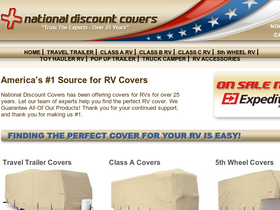 Discount RV Covers, at NationalDiscountCovers.com, are the experts when it comes to saving you some money on your RV cover purchase. NationalDiscountCovers.com have been offering RV covers for 25 years, and they are the most trusted source for RV reviews. Their team of experts will help you find the perfect RV cover. Discount RV Covers guarantee all of their products, and offer full warranties. For NationalDiscountCovers.com savings, NationalDiscountCovers.com coupons and NationalDiscountCovers.com discounts visit 58Coupons.com. Enjoy 5% savings on your orders, plus receive free shipping and free gifts from Discount RV Covers, when you use this code at checkout. Click link to get started. Any day of the week you will find select items discounted up to 45% at NationalDiscountCovers.com. Just head to the section you want to shop to see what's on sale today! Right now you can save 40% on wheel covers from NationalDiscountCovers.com. Plus they come with a three-year warranty. Sounds good. Click link to shop. Cover your propane tank for less at NationalDiscountCovers.com where they are currently offering a 40% discount on tank covers. Click link to shop. If you are a member of the Good Sam Club you can save 5% on your order at NationalDiscountCovers.com. Make sure to contact customer service before you order to receive this discount.